Kitchen Island is the setting for Wario Land: Super Mario Land 3. It is a skull shaped island that is the home base for Captain Syrup and the Black Sugar Gang. There are seven areas to the game, each one containing hidden treasure and one boss character at the end of each area. The common theme of all of the island's areas is that each one is related to food or something in the kitchen, in name and sometimes in appearance. Kitchen Island is located in the Capri Sea. Rice Beach is a basic starting world, with several beach-themed courses. The final two courses take place in the caverns at the back of the beach. The boss of the area is Spiked Pirate. After it is beaten, the tide comes in and Courses 1 and 3 become flooded with water, helping the player to reach various secrets. A secret exit can be found in Course 3. Mt. Teapot is a giant mountain shaped like a teakettle, filled with hot springs and some lava areas. Asparagus Lake sits at the base of the mountain. This is the largest world of the game, amounting to 7 courses (the fourth course is initially Course 10, becoming Course 13 once Wario activates a special trigger at the end of Course 12). The boss of the area is a muscular minotaur named Bīfun. A secret exit in Course 8 leads to Sherbet Land. Sherbet Land is an optional area, accessed by finding the secret exit in Mt. Teapot's Course 8. As its name implies, Sherbet Land is a massive iceberg, with typically ice-themed courses found within. Contributing to the "optional" theme of the area, the penguin-like boss Hinyari in Course 19 can be bypassed entirely by leaving through the door in the boss room. Further, he is the only boss in the game (aside from Denpū & Captain Syrup) that can be fought multiple times. Secret exits can be found in Courses 15 and 16. A deep canyon near the center of the island, filled with lava. The stages within are filled with fire-based hazards. A secret exit can be found in stage 4. The boss of the Canyon is a Funfun, a giant, floating ogre head. 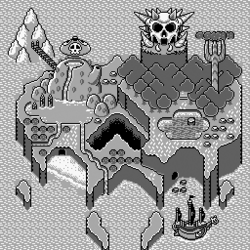 The levels in this area consist not only of the pirate ship itself, but the caverns, beaches, oceans, and jungles surrounding it. The boss of the pirate ship is Captain Syrup's pet, a massive buzzard named Bobo. This is a large forest area, with two stages that take place on moving shipment trains and two other stages that involve climbing fork-shaped trees in addition to other forest-themed stages. Fork Tree stands prominently in the middle of the forest. Initially, Wario is trapped here until beating stage 2, which drains the lake (as well as all of the water in stage 1) in the area and opens up an exit to the rest of Kitchen Island. The boss of this area is Zenisukī, a large ghost. A large, imposing tower at the corner of the island, a stone fortress with a skull-shaped castle at the top. As Wario fights his way up the tower, he destroys it bit-by-bit, revealing that its foundation is actually the giant golden Princess Toadstool statue. The final battle is against Captain Syrup. She summons the Genie to fight Wario, and upon her defeat, tries to take Wario out by dropping a huge bomb that destroys the last of her castle. Revealing that the statue was in the castle, Wario tries to take it but Mario arrives and claims the statue. ↑ Super Mario Land 3: Wario Land Japanese manual, page 16. This page was last edited on December 9, 2017, at 11:25.